NBA Basketball in New York is an invigorating experience. Basketball season runs from October to April. You can support the Brooklyn Nets in Brooklyn or the New York Knicks in Manhattan. The atmosphere at a game is awesome, even if you are not a fan of basketball, you won’t regret buying tickets. Games last between 2 and 2.5 hours a depending on if overtime is necessary. With a drink in one hand and a hotdog in the other a basketball game is a great way to feel like a real New Yorker! New York is the proud home to two big NBA (National Basketball Association) teams, the New York Knicks (officially known as the New York Knickerbockers) being the most famous. Madison Square Garden in Manhattan is the Knicks stamping ground and alongside the twenty thousand ordinary spectators, you can regularly see world famous stars sitting courtside to encourage their team. 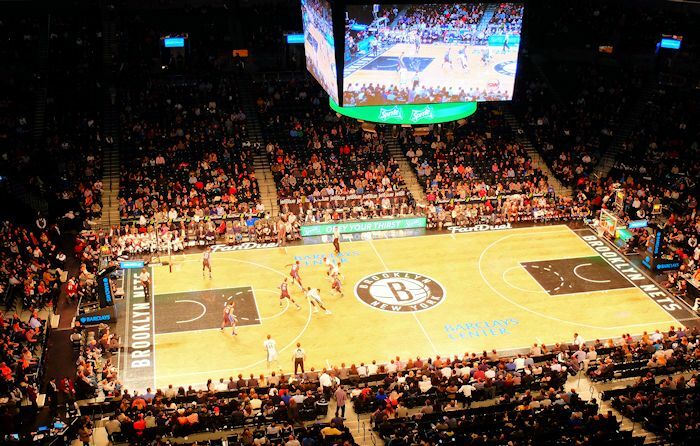 If New York Knicks tickets are a little out of your price range, check the calendar for a Brooklyn Nets game. Barclays Center in Brooklyn is home to the Nets and tickets to see this team are often cheaper. You could even bump into avid Nets supporters Jay Z and Beyoncé. The New York Knicks and the Brooklyn Nets are rivals, predominantly because they play in the same city. When they play each other it’s known as “Clash of the Boroughs”. The Knicks are my favourite team, one of the reasons for this is where they play: at Madison Square Garden, situated in the heart of the city, each game is an extraordinary experience. A basketball game consists of two opposing teams of five players. Each game commences with the singing of the national anthem, a remarkable experience. The game is split into four 12-minute quarters. The aim of the game is to get the ball through the metal hoop (basket) whilst obstructing the opposing team from doing the same. The players can dribble the ball over the whole court, once they are over the midline they are not allowed back with the ball. If a player stands still with the ball, he must pass it to another player or try to score a basket. If he scores from within the circle, the team get two points, from outside the circle, the score is worth three points and a free throw is good for one point. The team who ends the game with the most points wins. A draw is not a permitted outcome so in that case, there is overtime. There is a short break between each quarter in which an abundance of entertainment is provided, expect to see dunking contests, kids playing basketball and performances from the Knicks City Dancers or the Brooklynettes (yes, that’s their real name). The basketball season runs from October to April. The playoffs are the final leg of the tournament and begin in April. The NBA finals between the top two teams are played in June. If one of the New York teams reaches the playoffs you can buy tickets online, these tickets are in high demand so expect them to be more expensive than normal games. Eric’s Tip: Tickets for the Brooklyn Nets are often cheaper and the stadium in Brooklyn is easy to get to by subway. So if you really want to experience a New York Basketball game but don’t want to spend too much, buy tickets for a Nets game.